Layer the metallic fabric, felt and then paper patterns with the pattern side up. Pin. Using the sewing machine, use a long straight basting stitch following around the outer line of the big star of the star template. On the pdf pattern I made it is green. Sew right through paper, felt and metallic fabric. Trim the metallic fabric about a quarter inch from the sewn line. Next lay the other color of metallic fabric pieces on the felt side on top of each of the metallic star you already sewed. This is the felt side, not the paper side. 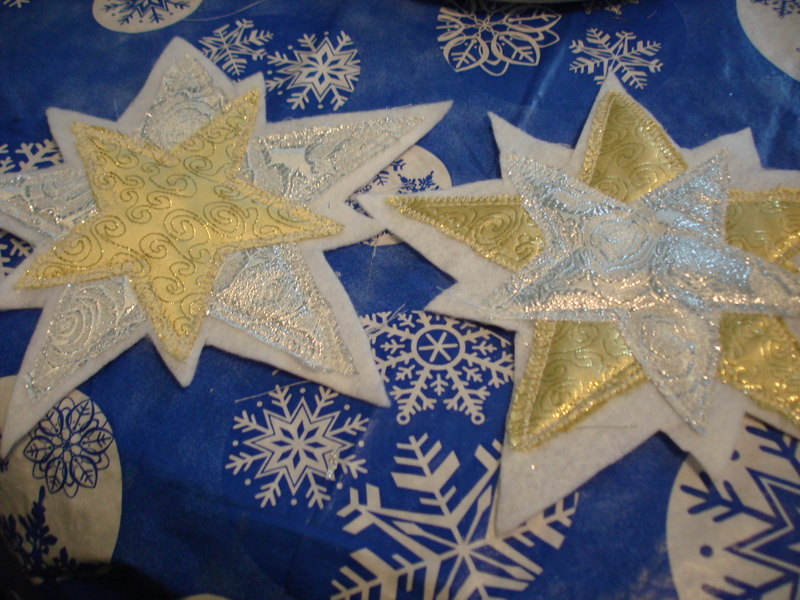 Make sure the second metallic fabric is centered over the red star on the other side. You may pin it to make sure. Now, flip it over and sew through all layers on the paper side on the green line, again using a straight stitch. Trim this star to about an 1/4-1/8 inch. 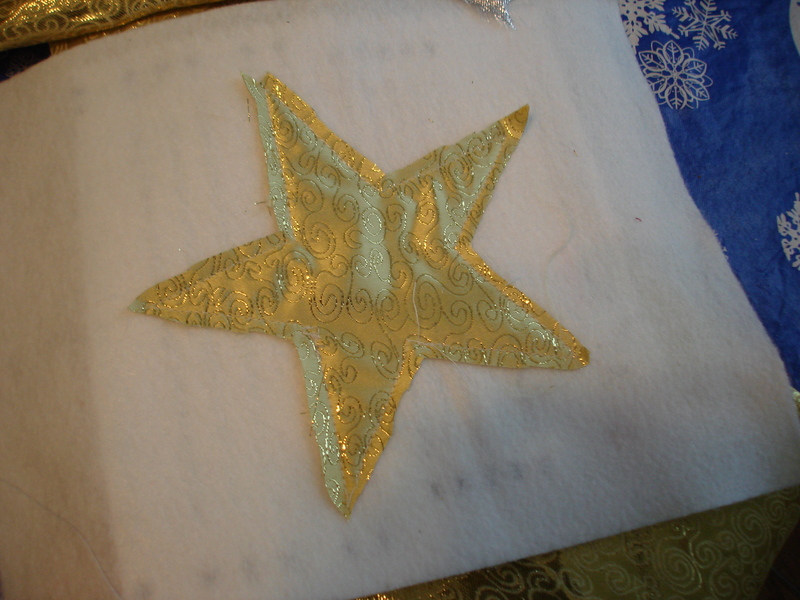 On each of the stars separately, use a satin stitch to go around the edges of the metallic stars. A satin stitch is machine stitch that has a very short length and a wide width. Do this from the right side. You are covering up the raw edges. If you wish, you may use metallic or rayon decorative thread. 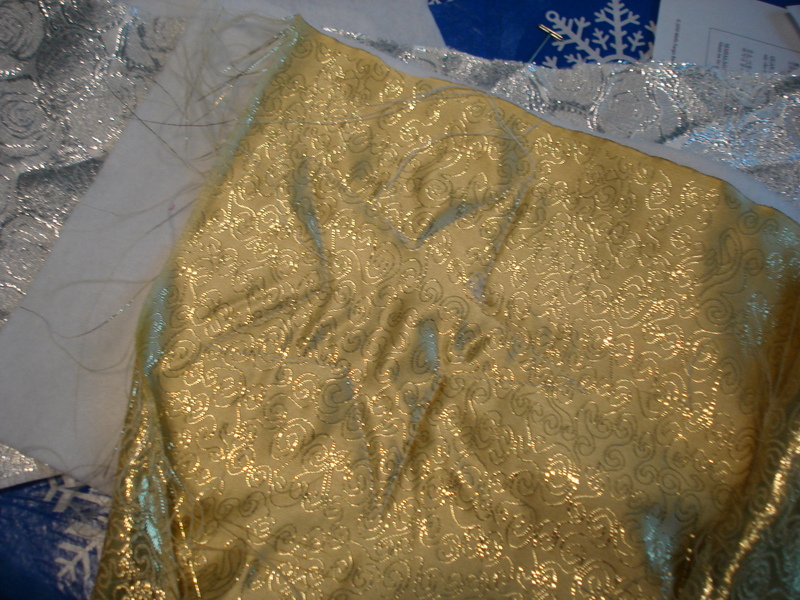 If you use specialty thread, use a machine embroidery needle or metallic needle for best results. Then trim the felt layer to about an inch. Put the two trimmed stars together and trim the felt so they match leaving at least 1/2 inch edge of felt around the star. Now pull any paper that is outside the outside line of satin stitching. If you tear off paper inside that line also, don’t worry. However, unless you plan to wash the star, you don’t need to tear off all the paper. I made the sides opposite of each other, but you can make them the same. At this time, if you wish you can add embellishments like the small beads I added. 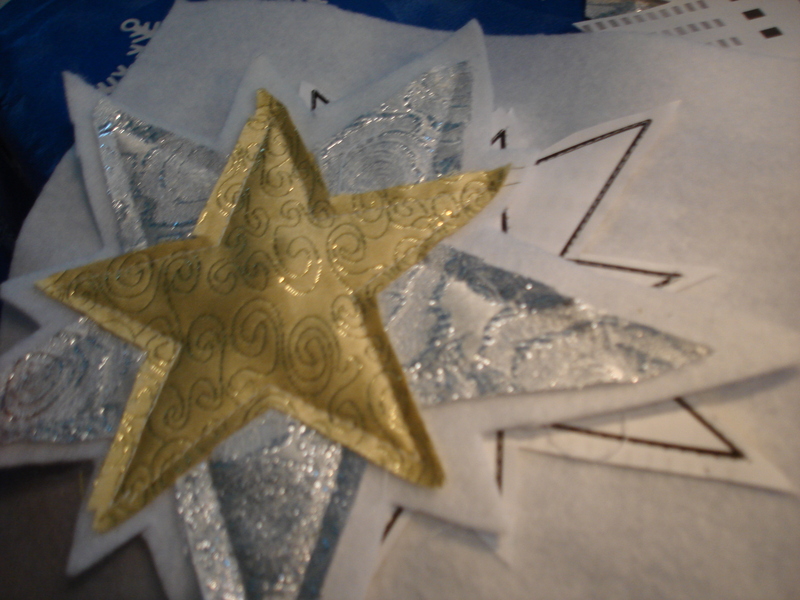 Baste the ends of the ribbon together to make a loop, and then to the back side of one of the stars. Now pin the star parts together, wrong sides together. 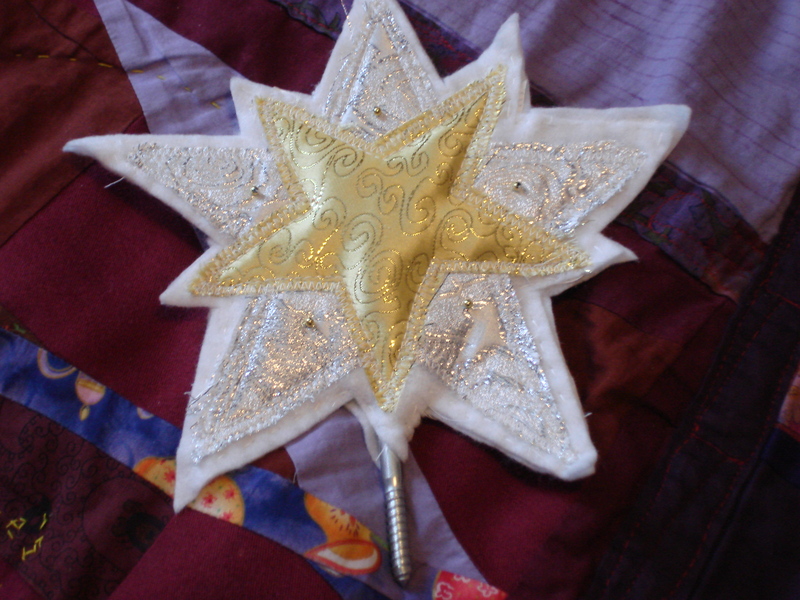 Carefully straight stitch around the star about a quarter inch from the edge. Try to stay on the felt, not the metallic fabric. Make a loop on one end of your wire, and position it as I have the screw. You can make your loop by turning the wire around a pencil and then flattening it. It doesn’t need to be as big as the screw. (Because of our particular Christmas tree, a screw works best, but for a natural tree a length of wire sewn partly inside with the part outside the star coiled will work better) Hand baste the loop end to the star using the picture as a guide. 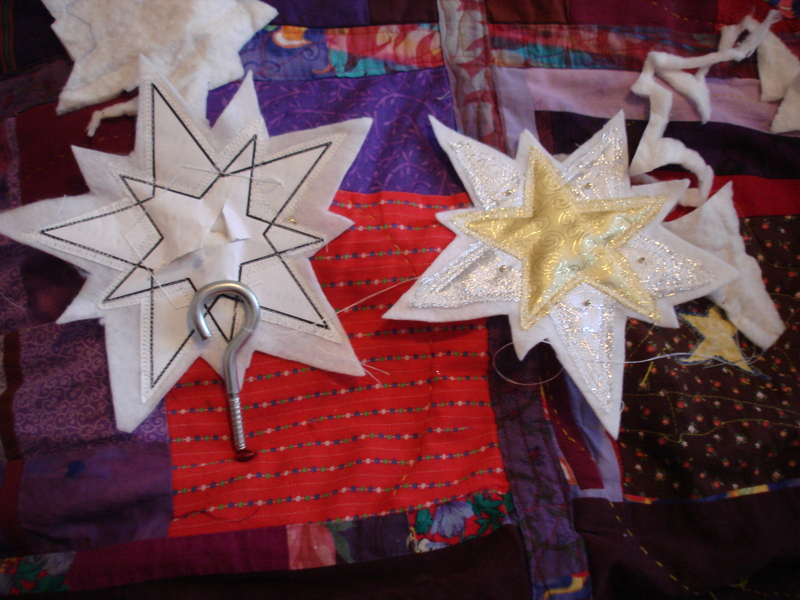 Pin the stars together wrong sides together and sew around the stars about a quarter inch from the edge. Try to only sew on the felt not the metallic applique. Start about an inch from the where the wire emerges and end about an inch from where it emerges on the other side. In other words, do not sew over the wire! If you are nervous, you can hand sew the whole thing. 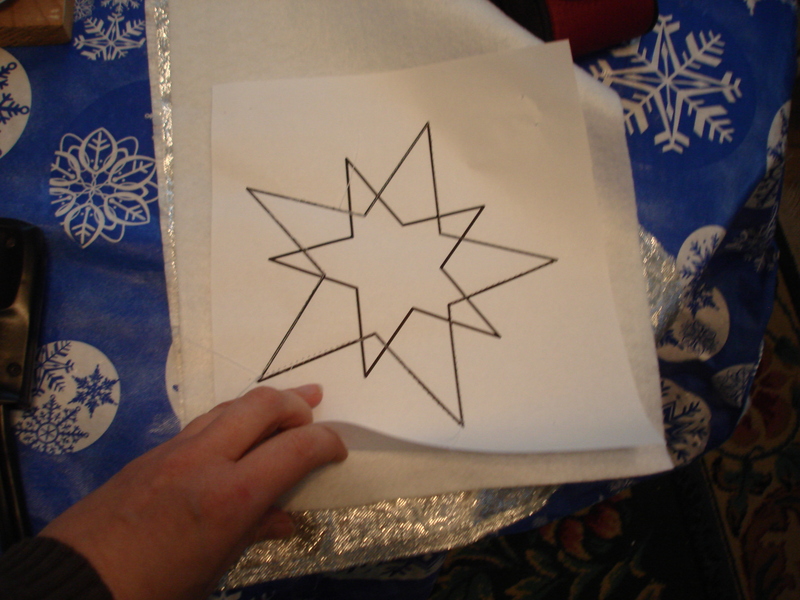 After you have machine sewn the star, hand stitch the area around the wire closed. Bend the coils down so you can attach it to the tree tops. am inspired! Very helpful info particularly the final section 🙂 I care for such information much.